The ever-reliable Ming-Chi Kuo with KGI Securities has some insight about what the iDevice maker's next-generation iPhones could give us. Although the Apple (NASDAQ:AAPL) iPhone 7 series smartphones only recently launched, credible rumors surrounding the iDevice maker's next-generation iPhone -- which many expect to be called the iPhone 8 -- are already circulating. The latest set of rumors comes from the generally reliable (and always interesting) Ming-Chi Kuo with KGI Securities (via AppleInsider). There's some interesting stuff here, so let's see what he has to say. Kuo expects that next year's iPhones will feature glass backs with metal frames, as phones with all-glass chassis aren't currently feasible "given technological bottlenecks." The analyst expects that Apple's more mainstream smartphones will feature aluminum frames while more premium models may be differentiated by the use of more expensive -- though, according to the analyst, more aesthetically pleasing -- stainless steel frames. Kuo says one of the key reasons Apple wants to move to glass is that producing the glossy finish that's currently used in the popular jet-black variants of the iPhone 7 and 7 Plus is difficult. He cites manufacturing yields of between 60% and 70%. He also points out that a glass back will allow for "better scratch resistance," something that he claims will "improve user satisfaction." It's quite interesting that Apple appears to be planning to more aggressively segment its product portfolio. This is hardly a new practice in the world of consumer electronics, but such segmentation actions are relatively new to Apple's iPhone business. I suspect that there are a couple of key business realities driving Apple to be more aggressive on this front. First, Apple simply has far more resources to invest today than it did during the early innings of the iPhone. 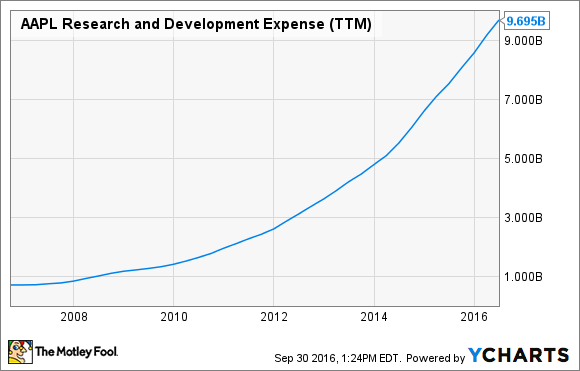 Indeed, Apple's research-and-development spending has soared over the past decade (see the chart below), as the company's successes with the iPod, iPhone, iPad, and the Mac have allowed it to invest substantially more into the development of future products. Building and ramping up into producing multiple variants of a product is no trivial task. However, the company's research and development budget is roughly an order of magnitude greater than it was back in 2007. Indeed, Apple's product development budget is up more than a factor of three from where it was just four short years ago. Next, the smartphone market itself is no longer growing at the high rates that it had previously. That means Apple can't rely on the rising industry tide to lift its iPhone business. It needs to be aggressive about building and offering a broader and deeper portfolio of products to service as many potential customers as possible. The reality is that the look and feel of a smartphone is an important selling point, and it's likely that the iDevice maker will be able to get a significant portion of its customers to pay more for a more "premium" looking design. The glass-backed model with an aluminum frame should be a premium design in its own right, but I'd imagine that there are customers that would choose to buy higher-end iPhones (for example, phones with larger on-board storage) simply for the even more premium look and feel of an iPhone with a stainless steel frame. And finally, at some point it simply becomes hard to gain further market share and grow unit shipments, even with a broader portfolio of products. This means that Apple is going to sell a richer mix of products. Apple has historically differentiated iPhones by storage tiers and, recently, by size (the iPhones with 5.5-inch displays command a significant premium to the ones with 4.7-inch displays). With increasing differentiation of higher end models (through both look and feel, as well as potentially technical specifications), Apple could very well drive a significant boost in iPhone average selling prices. It would seem that Apple's executive team is keenly aware of these business realities and, as a result, is changing up its product development strategy in a bid to capture as much of the revenue and profit dollars in the industry as possible. It's a good strategy, and as we see it really play out over the next couple of years, Apple's shareholders should be handsomely rewarded in the form of a return to iPhone unit growth and richer average selling prices.